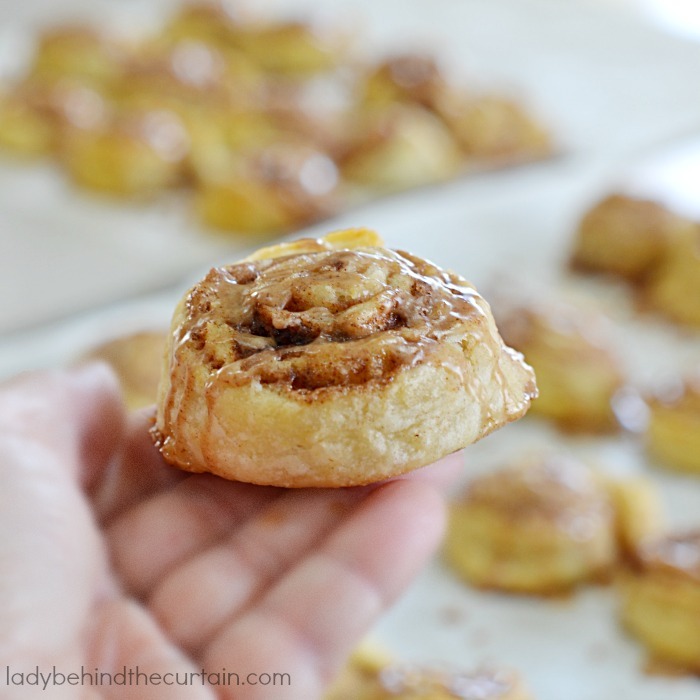 Mini Cinnamon Rolls| These one bite wonders are crispy on the outside, tender on the inside, filled with cinnamon goodness and topped with a nice cinnamon glaze. Perfect for a brunch or weekend treat. 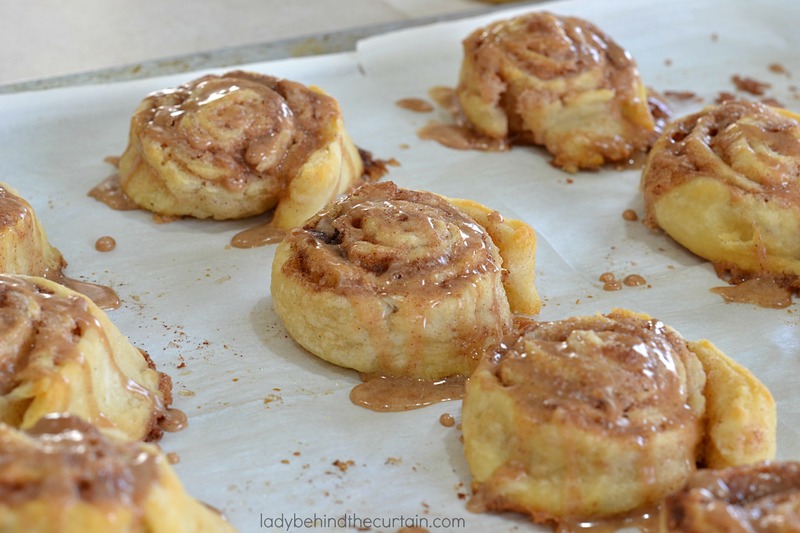 These amazing Mini Cinnamon Rolls can be made at least a month in advance. Look below and find out how you can make these delicious treats a month in advance. Freshly rolled and baked at room temperature. Bake for 15 minutes. Frozen and baked. Bake for 18 minutes. I actually prefer the frozen method. The cinnamon rolls seemed to keep their shape and I loved being able to take them out of the freezer and pop them in a hot oven. These are perfect for a birthday breakfast. Take out what you need and leave the rest in the freezer for another time. This recipe makes about 30 mini cinnamon rolls. Make a double batch and always have something sweet on hand (maybe not always but for awhile). This simple cinnamon roll recipe doesn’t require any yeast. Roll, slice and place on a cookie sheet lined with parchment paper. 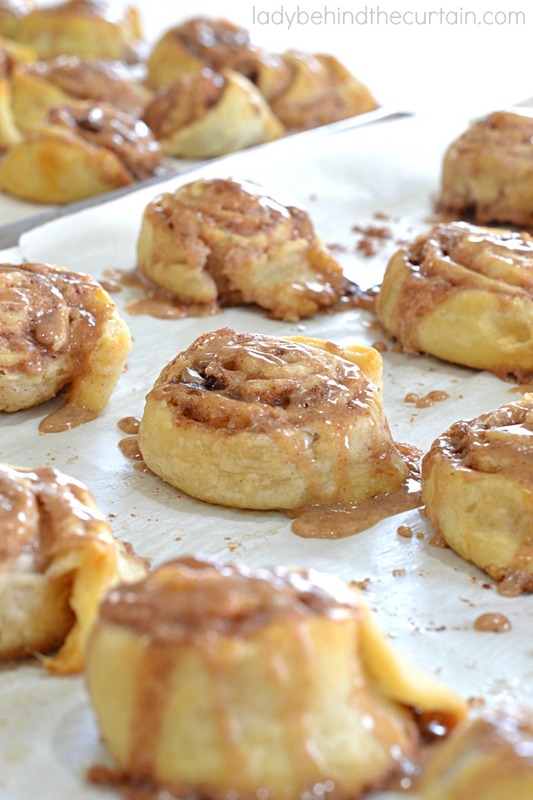 Place the cookie sheet with cinnamon rolls in the freezer until completely hard. Place frozen mini cinnamon rolls in large freezer safe bags. 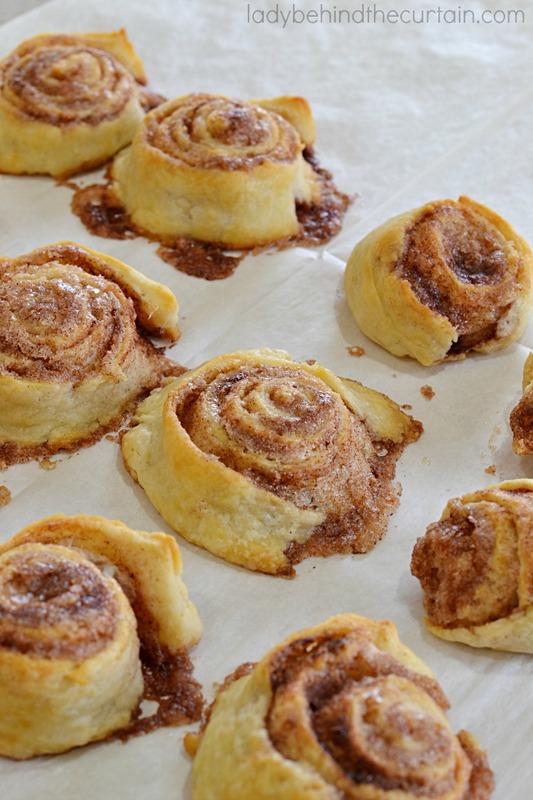 When ready to bake, place the cinnamon rolls on a parchment lined cookie sheet and bake in a preheated oven. Once slightly cooled add glaze. Using a ruler measure down the roll and mark at every inch with the back of a knife or scraper. Use your hand and lightly press the rolls down. In a large bowl mix together the flour, baking powder and salt. Using a pastry blender or two forks blend the shortening into the flour mixture. Add milk and mix with a large spoon until the dough makes a ball. Divide dough in two equal pieces. With a pastry brush, apply 1/4 cup of the melted butter to the rolled dough. In a small bowl add the sugar and cinnamon, stir to combine. Sprinkle 1/3 cup on top of the butter. Starting with the 17-inch side, roll the dough. Once the dough has been rolled press together to compact the inside and push the side in. This will help the roll to be stronger. 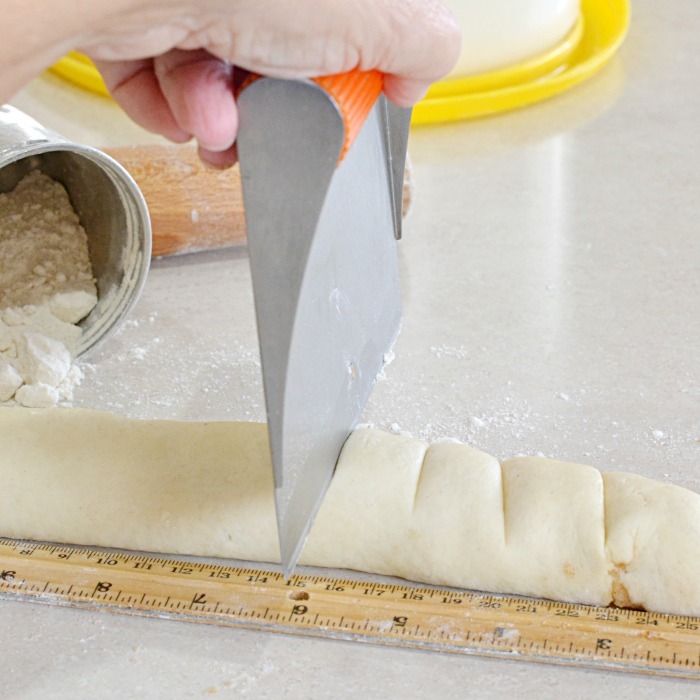 ;By the time the dough is rolled and pressed together it will measure about 15-inches. Using a ruler measure down the roll and mark at every inch with the back of a knife or scraper. Once the roll is marked go back and cut through the roll. Place the pieces on prepared pan, lightly press the rolls down. Repeat this process with the other piece of dough. Freshly made bake 425° for 15 minutes. In a medium bowl whisk together the sugar, cinnamon and water. Drizzle glaze over slightly cooled rolls. 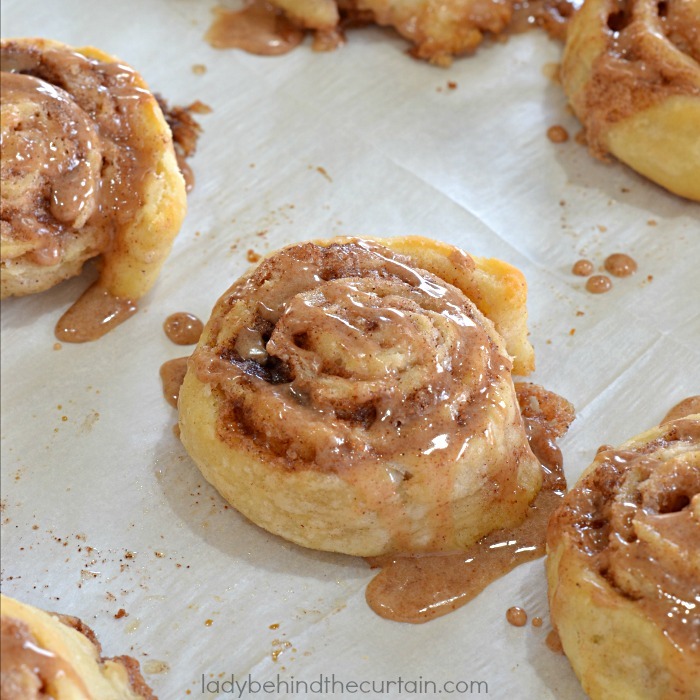 Place the cookie sheet with cinnamon rolls in the freezer until completely hard. 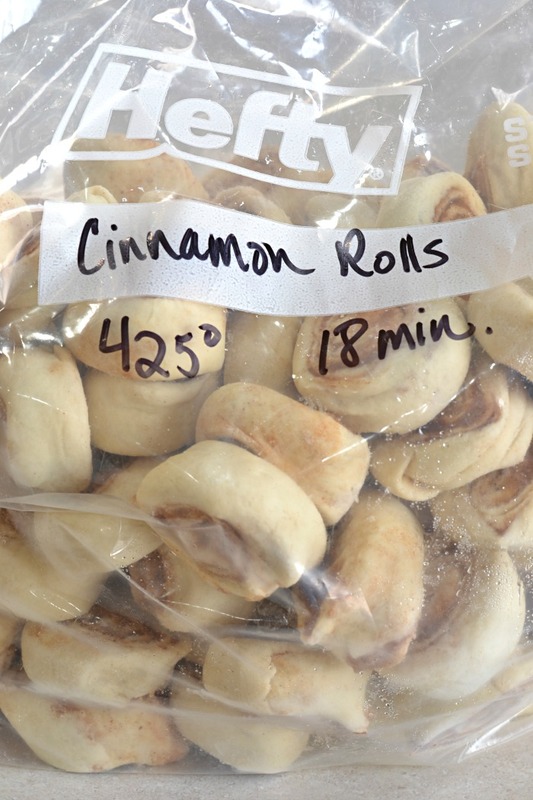 Place frozen mini cinnamon rolls in large freezer safe bags. 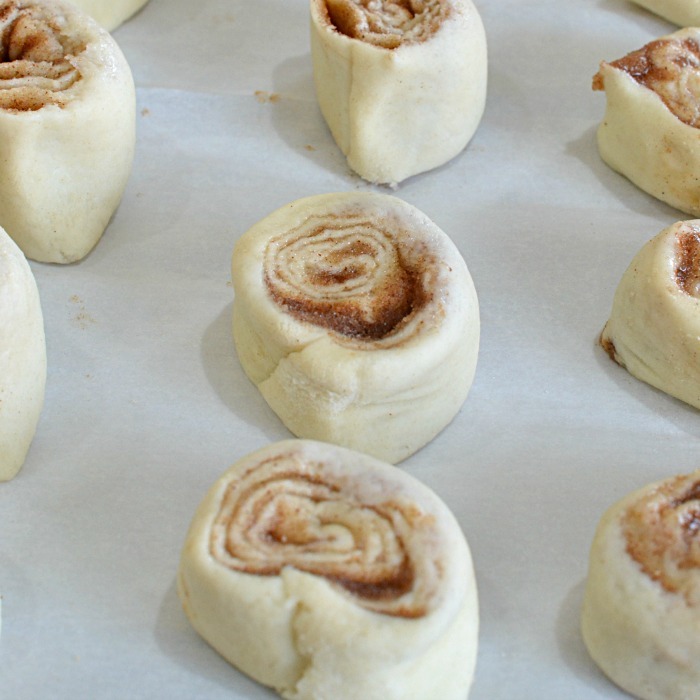 When ready to bake, place the cinnamon rolls on a parchment lined cookie sheet and bake in a preheated oven. Once slightly cooled add glaze.